Syria: Who Is the Real President Assad? 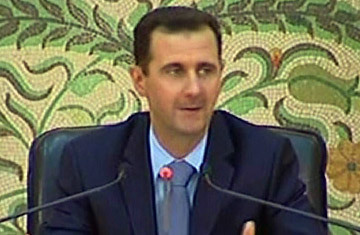 An image grab taken from footage broadcast by the Syrian state television shows Syrian President Bashar al-Assad speaking to his newly formed cabinet as his address is shown live to the nation on April 16, 2011, in Damascus. Syrian President Bashar al-Assad's carefully cultivated image as a modest leader with reformist leanings, close to his people and understanding of their concerns, has taken a severe beating after a month of brutal security measures against a burgeoning civil protest movement for greater freedoms that has slowly stretched across the country. The tall, trim, blue-eyed father of three has responded to the uprising in his country, the greatest challenge to his 11-year rule, with a characteristic mix of soft and hard measures, promising reform while also unleashing his security forces on the streets to crush dissent. On Saturday, the president said that the country's 48-year-old emergency law would be lifted next week, a major concession to protesters, but at the same time warned that acts of "sabotage" would not be tolerated. The comments mark just the second time Assad has spoken to his people since unrest erupted a month ago, and were more conciliatory in tone than his previous address. He acknowledged that the economy was "the biggest problem in the country," and that his regime should be more responsive to its citizens. "The world is rapidly changing around us and we have to keep up with developments," he said. "We have to focus on the demands and the aspirations of the people or there will be a sense of anger." Assad expressed sadness for the loss of life in demonstrations. "We pray for their souls, whether they're from the armed forces, the police or ordinary citizens. Investigations are continuing to find those responsible and hold them responsible." The speech came the day after protest marches took place across the country, including the capital Damascus. Assad's critics say his populist facade has been exposed as a pose and that the 45-year-old opthamologist has always been more like his much-feared father and predecessor Hafez al-Assad. The elder Assad's most notorious act, the 1982 massacre of Sunni Muslim extremists in Hama, served as a potent decades-long deterrent to anyone who would dare defy Syria's Ba'athist regime. But is this characterization of the young president accurate? Ayman Abdel-Nour, one of Assad's college friends, says it is  and it isn't. He remembers Bashar as a soft-spoken, humble and respectful young man, an attentive listener who didn't flaunt the fact that he was the president's son. They were two young Ba'athists hooked on "the drug of politics," who met in 1984 on the campus of Damascus University, where Assad studied medicine and Abdel-Nour engineering. To Abdel-Nour, there are two very different Bashar al-Assads; there is the man; warm, friendly and engaging, and then there is the president, somebody who "is not Bashar any more. Even his wife, his children, his brother mean nothing to him. He becomes the president of the Syrian Republic with all of this heritage of 7,000 years," he says. "Whatever measures are necessary for him to take, he will take them with no emotion, he has no heart." Bashar al-Assad was never supposed to be president. He became his father's heir apparent only after the death of his older brother (and Hafez's anointed successor) Basel in a car accident in 1994. The tragedy forced Bashar to abandon his opthamology studies in London and quickly return home. His brother's death changed him, says Khaled Mahjoub, a Syrian industrialist who says he has known the Assads since he and Basel were in kindergarten together. "He felt the responsibility," says Mahjoub, the founder and owner of Sukna projects, a green housing developer. "He was always responsible in his actions, but after Basel passed away, he had responsibility with authority." Mahjoub concurs that Assad has a certain steeliness, but says that's just a reflection of the burden of responsibility he bears. "When there's a serious meeting, he's extremely serious, at dinners he's fun, he can take criticism. He's a nice guy." Mahjoub hasn't spoken to Assad in the past month, but says they discussed the turmoil that toppled the presidents of Tunisia and Egypt and that now threatens other Arab leaders, including Assad. "Deep inside, I think he is hurt, deeply hurt, by seeing this blood in Syria. I know that," Mahjoub says. "We talked about it several times, about what was happening in Egypt, the violence there." The key thing to know about Assad, Mahjoub says, is that "he doesn't manage by crisis. He works based on importance, not urgency, and has a very clear, pragmatic and critical thinking that he uses." Yet crises have defined his time in office, from 9/11 and its fallout on the Muslim and Arab world, the 2003 Iraq war, the 2005 assassination of former Lebanese prime minister Rafik Hariri (which precipitated the Syrian military's withdrawal from Lebanon and a prolonged period of regional and international isolation that Syria has now emerged from), as well as the 2006 Lebanon war. Brian J. Davis, Canada's ambassador to Syria from 2003 to 2006, says that Assad is not a "creative" leader who will take risks or act in haste. "He will never easily concede to anything under pressure," he wrote on Professor Joshua Landis' influential blog, Syria Comment. Davis said that it was no surprise that Assad "offered nothing" in his much-awaited speech to parliament on March 30. It was his first public statement since the protests began and disappointed many who were expecting him to announce wide-ranging reforms. Instead, he blamed foreign conspirators and satellite media channels for fomenting dissent. "He has made a number of decisions that were not even necessarily in Syria's interests rather than be seen to give in to outside arm twisting (even his speech can be seen in that light)," Davis wrote. Assad has largely stayed out of the public eye during the crisis, recalling his father's distant mien, an image at odds with his public persona as an everyman dining in Damascus's restaurants with his young family and strolling through its souks. Mahjoub says its because Assad isn't "a tactical, retail politician. He doesn't like to talk to impress, he likes to talk to achieve." Abdel-Nour has a different interpretation. Assad is the public face of the regime, he says, and the less people see of him now, the less likely they are to associate him with the unrest. "If Assad loses this image, the respect people still have for him, the regime is finished," he says. Abdel-Nour is now estranged from Assad, personally and politically. The pair remained close friends for decades after college, attending family dinners and birthday parties, until a few years after Assad inherited the presidency upon his father's death in 2000. Abdel-Nour rose through the ranks of the ruling party to become one of only 500 civilian members of the prestigious Ba'ath Congress of loyalists (the other 600 places are reserved for military and intelligence officers), before defecting from the regime and becoming one of its leading critics, editing an independent website all4syria.org from the safety of Dubai. He says the coterie of intelligence officials, part of the "old guard" of the regime, alienated many of the young president's former friends and associates. "It wasn't just the case with me, it was the case with a lot of his friends," he says. "We had to stay away. We were told by bad people who are still now in their positions, so I can't talk about them." Assad has publicly denied that elements of the regime have curtailed him. Still, Abdel-Nour is clearly torn about a man he once admired. "He's a very dear friend to me," he said several times, in the present tense, while talking to TIME. For the Syrian crisis to end, he says, Assad the man will have to overrule Assad the president. "He should listen to the people and listen to his heart before being a president," he says, "because he will know what he should do."